Select the Books & Media tab on library.samford.edu and use the search box. The Samford Libraries Catalog searches everything cataloged by the University Libraries including goverment documents in print, microform, media and online. To limit before search, in Samford Libraries Catalog, go to (More Searches) dropdown on top right and select Advanced Keyword. 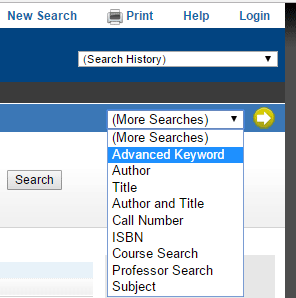 To limit after search, in Samford Libraries Catalog, go to top center, click Modify Search. Your search terms have been copied to the Advanced Keyword Search form. Add Limits (Optional) including Location, Material Type and/or others. HeinOnline Fully searchable, .pdf library of archival legal documents, from 1700s - present; includes Law Journal, Federal Register, Treaties and Agreements, and U.S. Supreme Court collections. Why would you need a government document? If you need a Public law or act, Primary source, or Statistics. Or if you have a hot topic, one of these might supplement your research: Congressional hearing, Relevant agency or department document or findings.